Scott Crow, an Austin-based anarchist, community organizer, political activist, and writer, was Thorne Dreyer's guest on Rag Radio on August 5, 2011, and Austin documentary videographer Jeff Zavala produced a lively video of the show. Crow, who has been labeled a "domestic terrorist" by the FBI, was the subject of a May 29 New York Times front page article about FBI surveillance of political activists in this country. Scott's organizing projects include the post-Katrina Common Ground Collective in New Orleans, which has been called the largest anarchist-influenced organization in modern U.S. history, and his book about that experience, Black Flags and Windmills: Hope, Anarchy and the Common Ground Collective, will be published by PM Press in September, 2011. 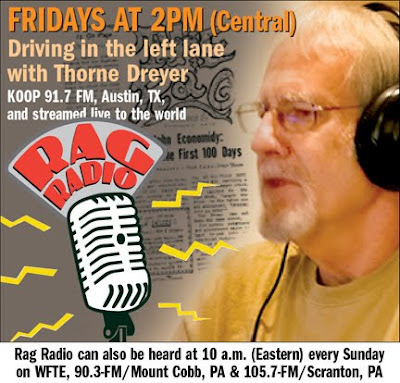 The Rag Blog has posted videos by Jeff Zavala of two earlier Rag Radio interviews -- with journalism professor and widely-published author Robert Jensen on July 8, 2011, and with Texas shrimper, environmental activist, and "Eco-Outlaw" Diane Wilson on June 24, 2011. Zavala is the creator of ZGraphix Productions and posts videos at zgraphix.blip.tv and at Austin Indymedia. Zavala is also the founder of the Austin Activist Archive, a virtual collective dedicated to broadcasting citizen journalism. Ted McLaughlin : Electoral College? Sis Boom Bah. Carl Davidson : Winter of Our Discontent?